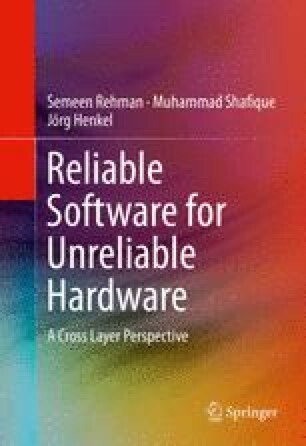 This chapter presents the background knowledge regarding different sources of the emerging reliability threats (i.e., soft errors, process variation, and aging-induced effects), the related work on soft error modeling, and their mitigation techniques. In particular, Sect. 2.1 provides the background regarding soft errors, starting with the basic transistor structure and its functionality, followed by various soft error sources and the soft error mechanism. Section 2.2 presents the basics of the NBTI-induced aging phenomena. Section 2.3 presents different variability sources and manufacturing induced process variation effects along with the process variation model explained in Sect. 2.3.1. Section 2.4 discusses the related work on soft error modeling and estimation at both the hardware and software layers. Starting from the traditional to more advanced approaches, Sect. 2.5 presents state-of-the-art soft error mitigation techniques at both hardware and software levels. As the focus of this work is on soft errors, most of the background discussed is related to soft errors. Towards the end, Sect. 2.6 summarizes the related work. IBM® XIV® Storage System cache: http://publib.boulder.ibm.com/infocenter/ibmxiv/r2/index.jsp [Online; accessed Apr. 2015]. Aeroflex, http://aeroflex.com/ams/ [Online; accessed Apr 2015].